SSCC Theatre will present “The 25th Annual Putnam County Spelling Bee,” at 7:30 p.m. on both Friday, July 24, and Saturday, July 25, and a family-friendly lite version at 3:30 p.m. Sunday, July 26, in the Edward K. Daniels Auditorium on the central campus of Southern State Community College in Hillsboro. An eclectic group of six mid-pubescents vie for the spelling championship of a lifetime. While candidly disclosing hilarious and touching stories from their home lives, the tweens spell their way through a series of (potentially made-up) words hoping to never hear the soul-crushing, pout-inducing, life-unaffirming “ding” of the bell that signals a spelling mistake. Six spellers enter; one speller leaves. At least the losers get a juice box. 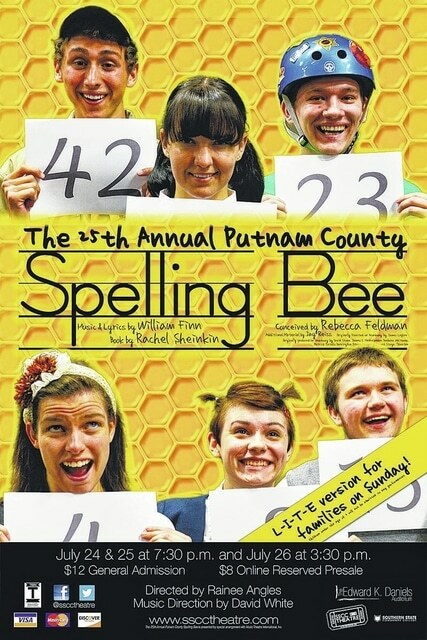 “The 25th Annual Putnam County Spelling Bee” features the acting talents of Cindi Anderson, Lydia Bolitho, Micaela Countryman, Celia Griffin, Benjamin Gullett, Bob Lambert, Ryan Oates, Zebadiah Pickering-Polstra, and Eric Silcott. The production team includes Rainee Angles (director/production), David White (music director), Abraham Martin (production), Laura Martin (costumes), and Gullett (public relations). Paula Campagna is the stage manager, and Madison Hatfield is the assistant stage manager. Fulfilling other crew positions are Brent Angles, Abby Van Brocklin, Coni Coleman, Cynnamon Sova Davy, Christine Giles, Bronwyn Jones and Ryan Tollefson. Tickets for “The 25th Annual Putnam County Spelling Bee” are on sale now and can be purchased for $8 by visiting www.sscctheatre.com. At the door tickets are $12. Credit cards are accepted for online purchases and at the door. Seats for this production will be reserved, so it is recommended that tickets be purchased early. “The 25th Annual Putnam County Spelling Bee” contains moderate language. To accommodate families, a lite version of the production will be performed as Sunday’s matinee. Children under the age of 6 will not be admitted to any of the performances. For more information about “The 25th Annual Putnam County Spelling Bee,” the upcoming 12th season and more, visit www.sscctheatre.com. Submitted by Kris Cross, Southern State Community College director of public relations.